Thank you for visiting our class page. I hope you find the information and news helpful. If you scroll to the bottom of the page you will find links to our curriculum coverage for this term and other items of interest. Year 5 have worked really hard on devising their own power point programme on the subject of Islam to present to Year 3 children. This morning we teamed them all up and spent time discussing what went well and how much the younger children have learned from the experience. MR HARTLEY AND HIS JAM! To help in our studies of old Southport we were delighted to welcome Rev Marie-Anne and her friend Emma who came into class this week. They told us all about the valuable work Mr Hartley and Mr Fernleigh had devoted to making Southport such a fine place to live in. As Christians they decided to fund many housing and building projects in Southport which is why we have such fine public buildings today. After their slide show and discussion they helped us all make our own jam tarts! Our thanks to Christ the King High School who hosted us last Wednesday morning, June 15th. We were given a thorough lesson in how to use the new BBC microbit technology. Now we can use this programme with confidence. Our instructor, Mr Henley was most impressed with the children's knowledge and enthusiasm. We have been so lucky this term having Mrs Wheelhouse teaching us about growing up. The Lovewise programme has helped us to understand all the changes that we will be going through as teenagers and how special it is to have children! Our view of The Crucifixion. This week Year 5 have been discussing the events of the death and resurrection of Jesus. Using the picture by John Reilly we were inspired to compose our own version of the death of Jesus on the cross. A reflection of death and life in the same image. Quite a challenge! Here are a few examples (we will be displaying more in school in the near future). 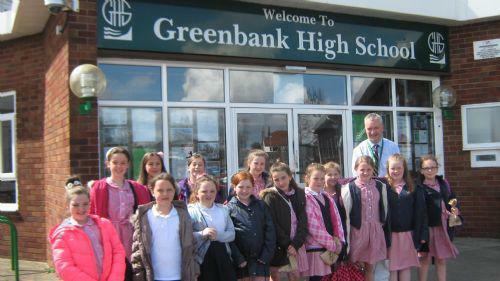 We all enjoyed an active day at Birkdale High School and Grennbank High School. The girls learnt about the Second World War; in food technology they made cookies; in science they investigated heating chemicals and their reactions; in P E they played team games. They also had a wonderful break time rolling down hills! 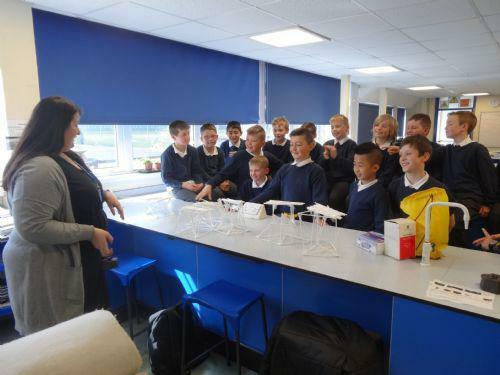 Our boys had a great day at Birkdale High School where they learned how to separate salt from rock salt using crushing, filtration and evaporation; the afternoon was spent solving mathematical problems with pupils from Year 7. 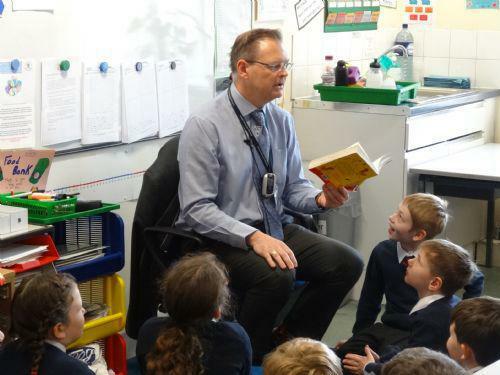 All pupils were made to feel very welcome and they were beautifully behaved from start to finish - but then we wouldn't expect anything different! We were delighted to welcome Mr John Pugh into class this morning. As our local MP he answered lots of really challenging questions from our Year 5 pupils and we had a lively discussion about democracy and the value of spelling tests! Year 5 have now started our six week course in drumming with our special tutor Mr Boden. We had a great start this week learning the history of the African drums then having a go playing them. The noise was... tremendous! We had great fun bouncing for a minute non stop on Friday March 18th all for a good cause; Sports Relief. Well done to Sam who jumped the most, 186! Thank you to those in Year 5 who managed to get to church last Sunday. It was wonderful to share our news about Africa and our friends from Rwanda. IT WAS GREAT TO HEAR ALL THE FAVOURITE CHOICES FROM YEAR 5. SO MANY GREAT STORIES AND AUTHORS. I HOPE WE MANAGED TO INSPIRE OTHERS TO READ OUR BEST BOOK. CARRY ON READING, FOLKS! Thank you to our friend, Dominic, who came to see us this week after his visit to Rwanda. 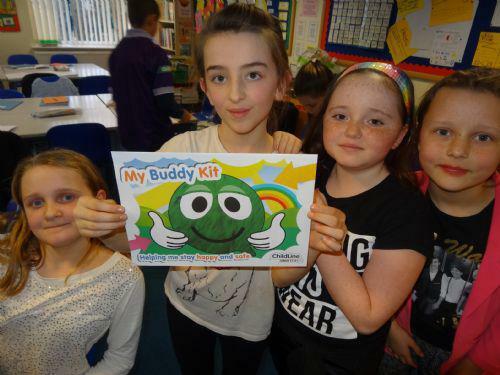 He shared his exciting news about the friends he met and the work he carried out. We sent personal notes about us to deliver to the village school he visited. Guess what? We all had a personal reply! 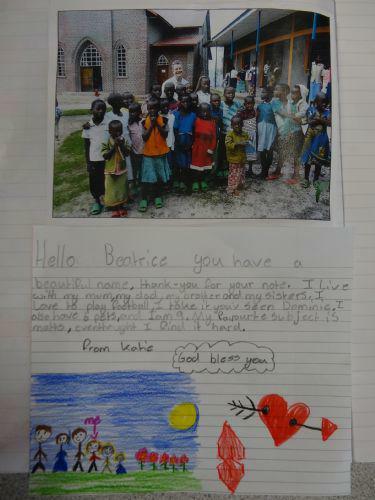 Now we have made new friends in Africa and have already started writing our replies. We really appreciate the work Dominic has done in building these new bridges across the continents! We thank you and ask for God's continued blessing in the great work you do for others. Thank you to Sam, who brought into school two genuine musical instruments from Uganda. The stringed instrument is called a Ndigit played at weddings, funerals, political ceremonies and other celebrations. This one pictured is made from dried straps of cow hide, pieces of wood and string. The second instrument is a shaker made from strong grass canes with dried beans inside. We were delighted to welcome Dominic Bray into class today to talk with us about his visit to Rwanda next week. This coincides conveniently with our topic on Africa this term! Dominic explained about the exciting links he will be making with people over there and we were particularly interested to learn about the local primary school which he will be visiting. Our children not only provided lots of questions for Dominic to take with him, but also a signed photograph so that we might form new links to children across the other side of the world. We look forward to Dominic returning to St Philip's, and sharing his experiences with us, in the next few weeks. For all the many cards, chocs and gifts over Christmas. You were very kind and now I have some serious weight to shed. We had a wonderful day on December 17th. We went to the Panto in the morning to see Aladdin at the Southport Theatre which was brilliant. When we got back we had the most amazing party. Our thanks to the welfare staff who set up everything for us. We have been busy making snowman pom-poms to sell on Thursday at the Christmas Craft Fayre. We worked very well and are so pleased on how they look! Come and have a look at them at the School Fayre! 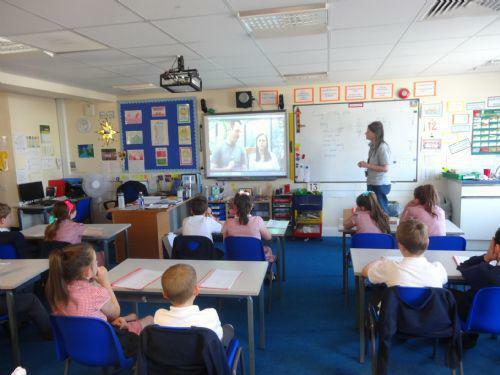 Our thanks to Chris from Childline who spent time with Year 6 and 5 pupils explaining how to stay safe and free from harm. The children listened really carefully and asked intelligent questions. 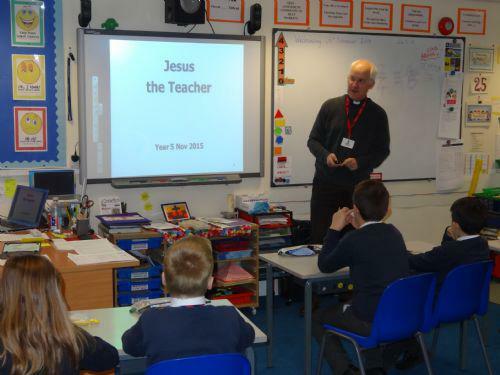 Rev Richard came to visit us this week to speak about Jesus as teacher. Now we know that Jesus used Authority, Parables, Arguments and that the most important lessons were taught during the Sermon on the Mount. Thank you for your inspiration Rev Richard. Well done to all our bikers this week who took part in the first stage of their training. The trainers were very impressed with the skills used and the good listening taking place. Last session next week, Nov 26th. 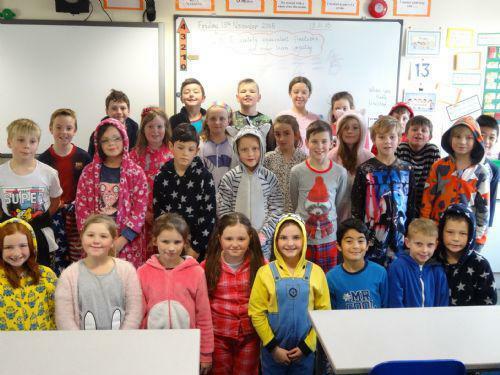 We all came to school in our pj's to support the school council's Children in need event. Thank you all for your generous contributions. 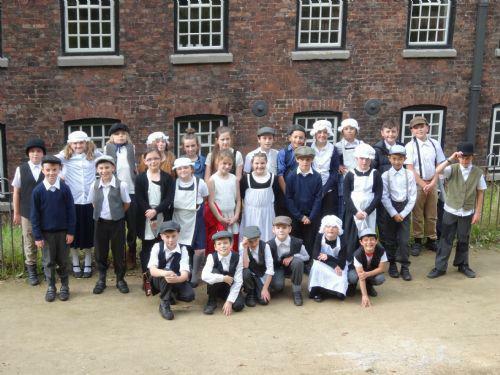 Thank you to Rev Kent and Mrs Kay for coming along to help us out on our school trip to Quarry Bank Mill. We had a wonderful day. The children went to so much trouble over their Victorian outfits. In year 5 we chose to study the cross of the Taize Community in France. This is an ecumenical place of worship for a group of twenty monks that live in a small village in central France. They welcome young people of every faith and nationality to join them in prayer, worship and fellowship. I hope you like our images of their famous cross. We had a great morning in Formby learning all about staying safe on the roads, railway line, Bonfire Night and all along our coastline. Now we are safety experts! A REMINDER; This term our Games lesson is every MONDAY and our PE lesson every THURSDAY. Please make sure your child has the correct kit in school on those days. HOMEWORK will be sent home every WEDNESDAY and should be back in school the following TUESDAY. 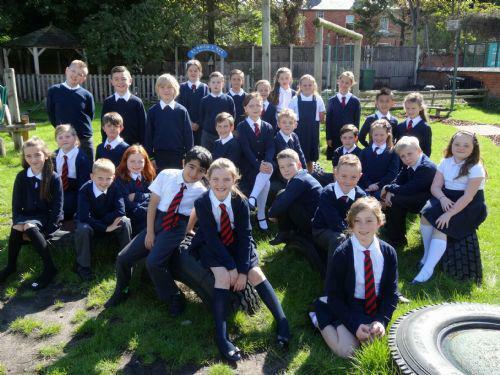 Our thanks to Birkdale and Greenbank High Schools who came to speak with Year 5 and 6 today, September 9th 2015. Our guests made us all feel very at ease about starting Secondary School and answered loads of our questions. Open evenings are coming up next week. Welcome to Sam and Tristan! The boys have settled in very well into our class and are making lots of friends! What are we covering this year?